Okay, so I've touted the amazing value of private lessons and also warned of the pitfalls on this site before. Both Duncan and Henrik have taken private lessons with the staff at IPH, down at H3 in Hamden as well as in Newington at Newington Arena. Now, I can't tell you how many people I've heard complain about how bad the ice is at H3 and how taking lessons there must be a waste. Often times, it feels like a slight towards IPH. Okay, sure, I'll concede that the ice at H3 isn't the best. It's not as bad now as it was a few years back but, yeah, it's fair to say that the ice isn't exactly ideal for, I dunno, a full blown scrimmage with adults tearing it up when it's 90 degrees outside. But it was never designed for that. And, as far as I'm concerned, a pretty decent one. Certainly beats any synthetic ice facility out there, that's for sure. There isn't a great substitute for real ice. I know it. You know it. H3 knows it -- that's why they have real ice and not synthetic. But this isn't a review of H3 or even the private goaltending coaching options available around here...this is a review of IPH Hockey. 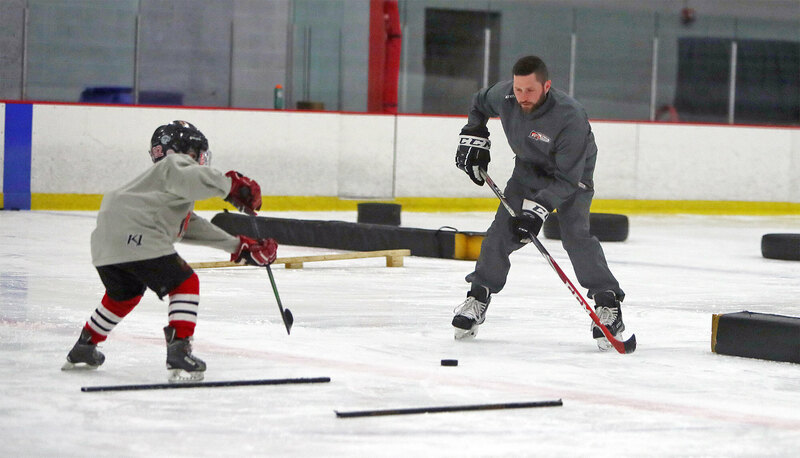 Private lessons can be really intimidating both for the parent and your little hockey player. From the parents' perspective, you're paying a lot of money to have a stranger *hopefully* teach your kid something new to give them a competitive advantage over their peers. With some private coaches, I've found myself doubting my kids abilities to even be with said coach. Are they in way over their heads? Like, is this too far advanced? Is this a total waste of time and money? For the kids, they have doubts...and fears too. When I was in second grade, I'd have been scared to death of pretty much anyone with a thick Russian accent. For that, I blame Rocky IV and Red Dawn. But, kidding aside, anything that's a one-on-one test of your ability is intimidating, really intimidating -- even for an adult. And when it's their first time out, well, yeah, you can't blame them for being nervous! So let's ease the anxiety a bit. Here's how IPH has worked, from my personal experience. You go to their website and email them about what you're looking for and Matt Whitney will get back to you within a few hours with tons of available times to choose from. 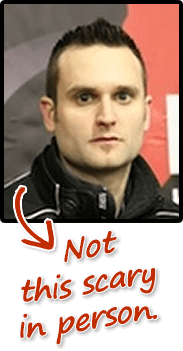 Pay no mind to his super intense profile photo on the IPH website -- that's it over there! With that first awkward contact out of the way, as a parent, you should be at ease. Your son or daughter can do this, you've made a wise decision, and it's a good fit regardless of how skilled your player is. So you pick a time to meet up on the ice and, before hand, you'll encounter Matt and his staff before you even send the kids on to the ice. He'll get right in there and start learning about your player and what you're looking for if you didn't already cover it in the email exchange. As your player heads out on to the ice, you'll be taken aback, "Wow, that guy is *really* outgoing..."
And your son or daughter will pick up on that too, putting them at ease...immediately. These guys and girls -- the entire staff -- are fun and have that knack for talking to children. They're gonna work your son or daughter super hard...but make them think they're just out there having fun. Duncan's done work with other private coaching groups, even a couple with thick Russian accents, where they put him through what I can only imagine is much like what the Red Army team of the 1970's went through. I mean, they'd push him to the brink of tears as if they were punishing him, personally, for the anti-Russian propaganda steaming out of every awesome action movie that came out during the 1980's. Frankly, I *loved* seeing Duncan work so hard trying to follow instructions that I knew he didn't quite understand. My favorite was when one coach was screaming "LOWER!" at him to get him to bend his knees more but Duncan was clearly hearing "SLOWER!" instead. Too funny. But I can totally understand how, doing that too often, would clearly break him. He'd get better at hockey, yes, but he'd be afraid before every single session. Depending on how many kids there are and which location you're in, you'll either end up with a single coach for the entire session or there will be multiple stations where the kids rotate from coach to coach -- one-on-one the entire time. For some of the kids, when you watch, it starts to look like a generic hockey practice where they do one drill for 10 minutes and then move to another station and do something different. Kinda like an extra hockey practice, just like your regular practices, that you're paying a premium for. I know, I know... Why on earth would you pay a premium for something you're already getting with your regular hockey team? 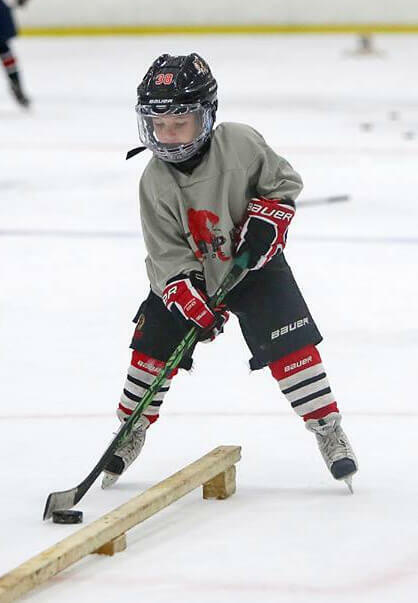 When I watch an IPH session, that appears to be what a lot of the kids are doing -- just having a one-on-one practice super similar to the practices my sons have with their teams two or three times per week. And that, just an additional practice, will make your skater a better player ... even if you're just doing drills that are very similar to a regular hockey practice. The difference being, here, you're getting one-on-one instruction (from someone who isn't a 'Dad' volunteer) and the kids never have to wait in line for their next turn to do the drill -- they just keep going. That's what you're paying a premium for. A fast pace is so important...and it yields results faster too. You'd think that would be obvious. I mean, it is a redundant statement, yes, but so many hockey parents fall blind to the value of a fast paced practice. For me, I like to use private lessons to fast track something that I see as a weakness in my kids' game so, I like to think, to get the most out of private coaching, you need to let them know what you're looking for. For us, a few years ago, the main goal was to work on the kids' skating. Not so much edgework, but more explosive starts...and IPH did just that. Well, they tried. Henrik was just "going through the motions" but I can't put that on them -- that was on me thinking a 5 year old could be explosive. More recently, Duncan's shot has needed work. More power, shooting in stride, quicker release, but really, just the opportunity to practice his shot, on the ice, over and over and over and over again with expert instruction along the way. We've been going every other week...and will continue through the entire off-season. 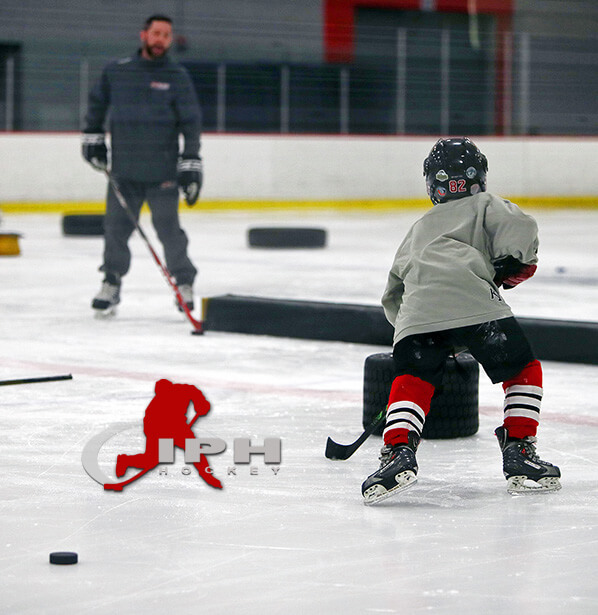 At our last session, there were 3 kids on the ice, and three different stations -- each with a different IPH coach. Duncan's first drill was a lot of transitions, forward and backward crossovers with the puck, followed by a shot on goal. The next station, which had been exclusively a footwork drill for the previous kid, was still a footwork drill...but now included a fast pass, break to the net, and then opening up for a one-timer on the return pass. Clearly catered to my desire to have him work on his "shot". The next station was more of the same. This time he was shooting on the move and aiming to put the puck through a tire on what would usually be the opening on the blocker side -- different enough to trick my son into thinking it wasn't just a bunch of shots on an empty net...which he finds *dreadfully* boring at home. Truth be told, nearly all of IPH's drills end with a shot on goal anyway...but that's what keeps the kids engaged. First bumps, pats on the head, loads of encouragment, and lots of "Hey, wait, try to do it like this next time" moments as the coaches demonstrated the movement. Something I've found lacking in a lot of the "popular" hockey camps (you know, the ones advertising on every other page of the USA Hockey magazine that you receive each month) is adequate demonstration and encouragement to try again, over and over, until it's done correctly. Those camps just want your money and could care less if your kids get better -- next week they'll be in another state with another set of kids aimlessly skating around cones at half speed. No sense of accountability for them. The IPH staff "get it". You're paying them to get results...and they know that. I've yet to see a player that I know works with them not get noticably better...and I do feel that they have a certain sense of pride when a player nails it and puts an old bad habit behind them. As my kids come off the ice, they're wishing the session wasn't over...totally unaware that they're sweating like crazy or that they've been skating, pretty much, non-stop for an hour. "Wait, this isn't a water break? We're done? For real?" Cost wise, we've done private lessons with costs varying from $40 to $120 for an hour of instruction. IPH falls right in the middle...but value-wise, they're at the top of our list. I know some parents, like I said earlier, write it off as a rip-off thinking "Why would I pay that much for just more of the same I already get from the regular team practices?" and I can understand that...but those parents are WRONG. The kids get better, way better than they would at team practices alone, and have fun at the same time. That's huge. Hockey is supposed to be fun. And it's even more fun, for the player (and the parents too! ), when they're one of the more skilled players on the team. You can pay them before or after the session -- I lean more toward before out of courtesy so they're not having to hunt down parents just as another session is beginning even though Matt has always, every single time, come out to say thank you and to mention/review briefly what he's told my sons they need to work on. I've always paid in cash and that seems to be the standard with this sort of thing -- even while observing the high end Figure Skating coaches on the ice before we are. It's almost comical, in arena lobbies, how many adults are pacing around with a wad of $20's in their hand like they're waiting for a "deal" to go down. Take a look next time. There's a ridiculous amount of cash floating around. And with IPH, there's no sales pitch to come back or passive agressive "see you next week" tactics...and I really appreciate that. Really, they don't need to stoop to that kind of marketing -- just watching them work, you can tell they know what they're doing and love what they're doing too. That vibe rubs off on the kids and they end up having a blast as they improve their skills. Oh, and if you're still on the fence and want to do some more research, they've gotten a lot more active on social media recently -- Instagram, mostly. But don't be intimidated by the videos of the big kids cutting left and right before going bar down. My kids aren't that good either...but they will be! For real, as long as your kid can skate already, IPH can take them to a new level. The IPH Website is here. And if the picture of Matt up above still haunts you, here's some old video footage from Gotta Love CT Hockey that featured him. He's toned down here a bit, being on camera does that to people, but I think it comes through that he's a super nice guy who's passionate about making kids better at the game he loves. Full Disclosure: Mike Harder, the founder of IPH Hockey, and I worked together while he was a member of the Hartford Wolf Pack. That said, since he was on-ice talent and I was not, our interactions during those two seasons where there wasn't a sheet of plexiglass between us amounted to maybe 10 minutes that I'd bet he's long forgotten.